Quickly and Freely Remove PDF Password Protection to Open, Edit, Copy and Print! You are the encrypted PDF owner, but you forgot the password to open it. Get a password protected PDF document and can't open it. Want to edit a PDF file, only to find it is password protected from printing, copying, editing. Downloaded PDF files are locked with passwords. PDF Password Recovery supports two kinds of PDF passwords recovery: User Password and Owner Password. 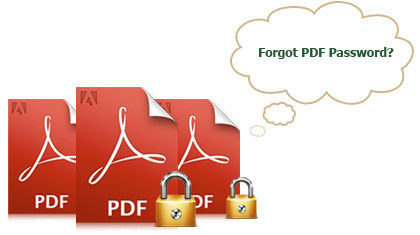 Unlock a secured PDF file without modifying PDF content. Recover the User/Open Password within minutes. Disable the restrictions in standard password protected PDF file. Only with 3 steps, you can finish PDF decryption. Get possible fastest decryption speed by adopting multi-core CPU processing and GPU acceleration. Standalone, it works without Adobe Reader and Acrobat installed. Empower users to upload up to multiple PDF files to decrypt the protections at a time, saving lots of time. Supports all PDF versions release to date, including PDF 1.8 (Acrobat 11). PDF document passwords come with 40-bit, 128-bit and 256-bit encryption can be recovered quickly and easily. Work on Windows OS including Windows 10, Windows 8.1, Windows 8, Windows 7, Windows XP and etc. Support PDF files in any languages: English, German, French, Italian, Japanese, Chinese, Turkish, Thai, Latin, Korean, Greek, Cyrillic, etc. Users of PDF Password Recovery Have Surpassed 800,000+ Worldwide. "It is a superb app that allows me to remove PDF restriction on PDF editing, copying and printing. I will recommend it to my friends."